After the recent selection of Donald Trump as president-elect of the United States, many people have tried to fathom how most of the polls were inaccurate in predicting his victory. Richard Dawkins tweeted that pollsters got it wrong because the people they were talking to simply “were ashamed to admit they were Trump supporters.” Sarah Haider added that “when political correctness takes over—you don’t know how people actually feel.” These statements go a long way to explain how the predictive polls were inaccurate. But more important than the inaccuracy of the polls themselves is an interesting fact revealed by the final election results—52 percent of white women supported Trump, while Clinton received 94 percent of the votes of black women. 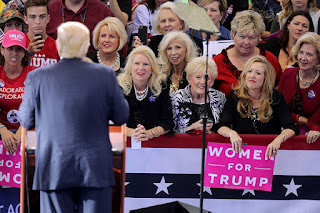 Who are these white women? Why did they vote the way they did? Are they simply opposed to reproductive rights for women? Unconcerned about family leave? Oblivious to health care programs like the Affordable Care Act? Blind to the future student loan debt of their children? It is very likely that these women are highly religious. The Pew Research Center has identified that 81 percent of those who identify as white, born-again Evangelical Christians voted for Trump. Nearly 90 percent of Republican women voted for Trump. We can infer that a large number of the white women who voted for Trump were Republican and religious. But is it just that these women identify as religious, or is there a stronger aspect of religion at work here? Is there a reason they might be less likely to support a woman candidate for president and to vote against policies that might be in their self-interest? Yes. I believe it is the legacy of worshipping a male deity and the psychological impact of this on very religious women, particularly Evangelicals and Fundamentalists. Karen L. Garst, The Faithless Feminist Take women from their housewifery and they are good for nothingWith a sole male deity and men as priests, rabbis, and imams, it was rare for women to even question the power of male leadership until the 19th century. In Fundamentalist or Evangelical households, the impact of the worship of a male deity is still pervasive and its impact on women manifold. First, there is a strong emphasis on sin. Ann Wilcox, one of the women who wrote about her upbringing as a Fundamentalist in my book, Women Beyond Belief: Discovering Life without Religion, states that people are taught not just that they commit sin, but that they ARE sin. This doctrine was emphasized throughout the history of Christianity by such notables as St. Augustine, who lay the responsibility for the cause of sin—carnal lust—squarely on Eve and therefore all women. Second, as stated in 1 Corinthians 11:3, the father is the head of the earthly home and thus rules over women. Fundamentalists still cling to this prescription today as in the statement— “a woman’s ideal fulfillment is usually motherhood.” Marsha Abelman, another essayist, was raised in the Church of Christ. She writes that her father had complete control. She recently told me that if her father would have sexually abused her, there would have been no one to deny his right to do so. Third, love in marriage is defined as obedience to the husband. Fundamentalists state this plainly—“the husband being the head of the wife and authority over the children.” Ann recounted that her mother talked back to her father once and he immediately grabbed her and told her to stop. She never did it again. Is it any wonder that women, strongly under the influence of the type of Fundamentalist religion that teaches that women are sinful, men are in charge, and their job is to obey, voted for Trump? Wasn’t he the epitome of the man in charge during his campaign? Over and over he used the language of male power. Nearly every statement he made was couched in terms that HE would be in charge and HE would make things happen. He rarely talked policy. He rarely cited specifics. “Let’s Make America Great Again!” He rarely talked about working with other politicians or any team whatsoever which might have diminished his perceived power. His language was the same that these white Evangelical women had been hearing from their earliest moments as children of controlling fathers, every day in their homes as wives, and several times a week at church. When I fall asleep at night, words come unbidden to my brain. I start to recite a children’s prayer I learned long ago—“Now I lay me down to sleep, I pray the Lord my soul to keep….” Even though I have now been an atheist for decades, my brain still replays that veneration of a male god. Imagine how amplified this focus must be for women who attend church every Sunday, most often with a male standing in front of them pronouncing faith in the one true male god. Every song, every ritual, every doctrine does nothing but emphasize this maleness. It would be interesting to see a psychological study on how Fundamentalist women, more liberal Christians, and atheists would rank male and female leaders. A comparison of these three groups might reveal the deep psychological impact that religion has, particularly on women. In the meantime, there are resources to help people recover from religion, especially the toxic, misogynistic Fundamentalist ones. Recovering from Religion has now established a hotline for people to call in and talk with an individual who can help them. Ex-Christian.net also has resources for people who have left Christianity. And there are many others. But what is our role as individuals? We cannot sit idly by while people are indoctrinated into believing that women are not the equals of men. If you are uncomfortable talking to religious people, get the new app Atheos. It is a guide to help people have “non-confrontational discussions about gods, religion, faith, and superstition.” Be open about your views. Every person needs a model to emulate. Remember the small African-American boy looking up to President Obama in the White House? He now knows marginalized people can be anything they want. Let’s all be models to show how great it can be to leave religion behind. And maybe someday elect a female president! Leonard Shlain, The Alphabet Versus the Goddess: Male Words and Female Images (London, England: Penguin Press, 1998), 329. Karen L. Garst, Women Beyond Belief: Discovering Life without Religion (Durham, NC: Pitchstone Publishing, 2016), 30.